The LEGO Group uses customized 'Augmented Reality' technology from German company Metaio, to boost consumer experience at retail shops , . 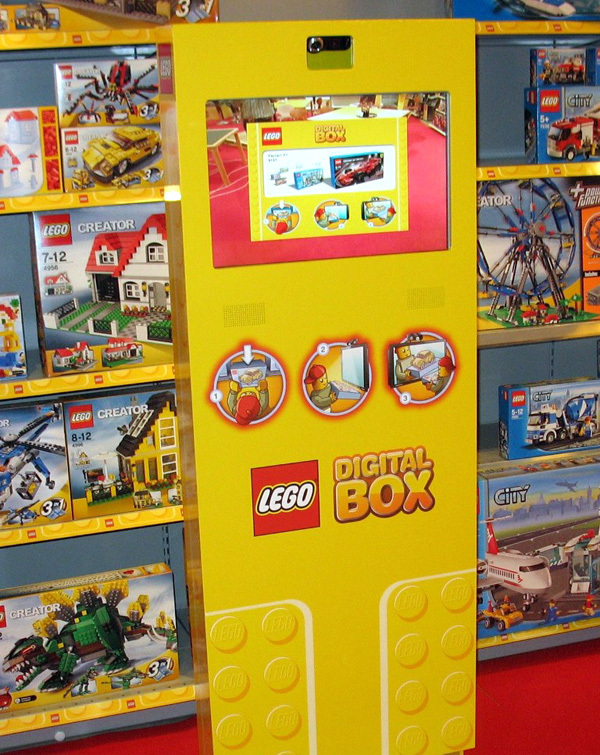 'Augmented Reality' is a quickly growing trend and TLG will test the launch of its 'DIGITAL BOX' in selected toy shops and LEGO® stores worldwide. 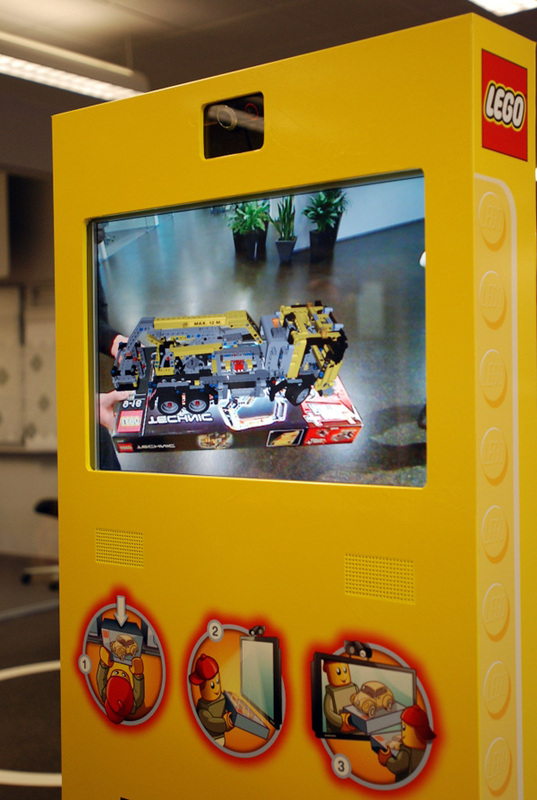 The software within this interactive terminal, uses innovative technology, a built-in camera and a display screen to let LEGO packaging reveal its contents fully assembled within live 3D animated scenes. This image of a 'DIGITAL BOX' terminal from the LEGO Group, shows you exactly how the product will look when it has been fully assembled, even before you open the box. Making use of a TECHNIC set, bellow you can see a demo from this technology, with an earlier prototype for the new LEGO retail kiosk. Via RoboticEducation, Oh Gizmo! and Notcot. When I first saw it, I thought it was just a video screen with touch so you could change videos. But that is really awesome. I wonder how it senses which way up the box is. Image comparing? Any of you techies out there know how it works? I believe the SW implements some pattern recognition algorithm, to recognize which box it is and which way it is up. Then from info into a DB, it retrieves data from the respective model (either it is A or B) for a realtime rendering as the user tilts the box. I guess it works like face/smile detection on modern digital cameras, recognising a pattern and its angle, and then (in this case) superimposing a digital rendering using the same position and angle. Awesome- I really hope one of these shows up at our local store!! The idea is cool. But how much it will useful. This can help save space for the game. You write so well. I would like to read an article about the Lego history, like here - https://invisible.toys/lego-history.